Lest we forget, the presidency of Mahinda Rajapaksa was an exceptional display of State sovereignty. The hand that held sovereignty decided who lived, who died, who vanished and who was reprieved by the benevolence of the supreme law giver. ‘He left his foot print on stone and he passed on’. It is how African tribes described the fate of Misérables disturbing the serenity of the mind of the chief of the tribe. Lasantha left his foot print on stone and passed on. Keith Noyahr stepped on the stone but slipped before his foot print took hold. Mahinda Rajapaksa provided these pleasantries and quips to the press after his interview with the CID officers. It was a choreographed ‘walkabout’ in the ample compound of the official residence he occupies as a former Head of State. He faced the cameras surrounded by a battalion of bum-kissers ready to break into wild cheer at every bit of bombast that emanated from the great man. Oxford Historian Timothy Garton Ash once observed that just as an adult without a memory is a child, a nation that collectively contribute to a loss of memory is a childish nation. So let us not go there. What, indeed, was wrong about reprieving a man after beating and maiming him to pulp? There is nothing wrong about setting a man free after abduction. It is pure evil. Bodhisattva Rajapaksa is oblivious to the thin line that separates wrong from evil. This essay is about the good and the evil of Mahinda Rajapaksa. Exhuming history is not a feasible proposition with Mahinda Rajapaksa or Gotabaya Rajapaksa, the principal enforcer under his presidency. The absurd drama staged after the putative probe by CID investigators in to MR’s knowledge or the lack of it on the ‘Affaire Noyahr’ is abundant proof of the inexhaustible supply of the chummy, chameleon-like charisma of our war winning president. He is incredibly resilient, intimidatingly provocative and immensely crafty. The English language has a word for such formidable fortitude. He is a ‘badass’ in the true sense of the word. That ‘badass’ has an equally endearing nuance in our colloquial Sinhala is pure coincidence. In the fortnight since the CID interview we have been treated to a good dose of MR’s matchless mastery of political theatre. He faced the cameras surrounded by a battalion of bum-kissers ready to break in to wild cheer at every bit of bombast that emanated from the great man. The press permitted in to the event, measured up to the task by framing questions that reflects the puzzling spirit of our post-civil war political discourse. Mahinda Rajapaksa responded with aggravated indignation. ‘This is politically-motivated harassment. They think it will not happen to them’. He could not recall a late-night telephone call from Karu Jayasuriya on that bleak night when Keith Noyahr went missing. The CID decision to question him was mischievous mudslinging and an attempt to link brother Gotabaya to the incident. It is nothing but a revengeful rollick of a failed and failing regime. These responses of the former President reveal the monster lurking in his Sinhala Buddhist Patriotic breast. This simple straightforward rhetoric of Mahinda Rajapaksa unclothes the anatomy of the liberator who eliminated the barbarity of the terrorists and delivered our nation in to a blissful repose of nothingness under the Rajapaksa family oligarchy. Let us not underestimate badass Mahinda, the Sinhala Buddhist Patriot President. He holds the puppet strings of a huge swathe of Sinhala Buddhist public opinion that is nearly half or slightly more. This huge support base holds him not in admiration but in pure unadulterated veneration. He created, master minded the concept of heroic humanitarian slaying and coined the term ‘Ranaviru’ that has intimidated peace time political opponents in to a state of exasperating and excruciatingly painful impotence. 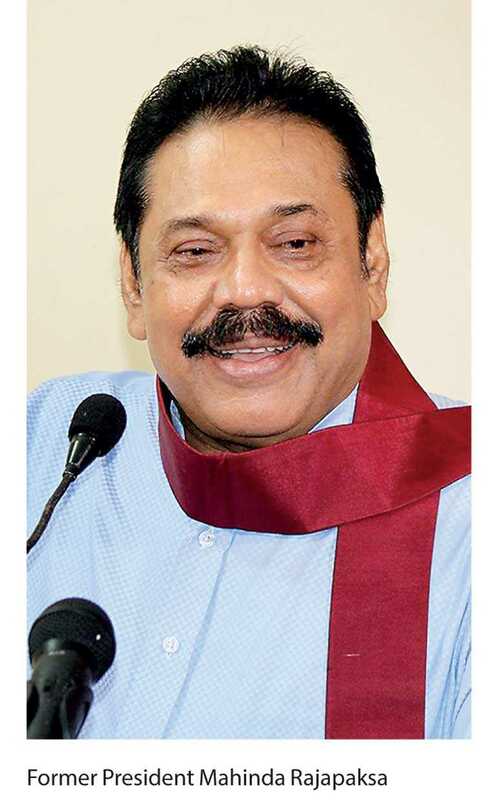 When Mahinda says he cannot remember, it means that he as the redeemer of the nation at the lagoon at Mulawaikkal does not wish to either talk about it or to be challenged on his credentials as the man who ended the war. Memory politics is not for Mahinda Rajapaksa. This writer makes this assertion with haunting humility and deep despair. I know may people who would gladly endorse what Mahinda says or does without batting an eyelid. Most of them are highly-educated professionals who have mastered their respective disciplines. We are a people among whom are thousands that mourn the deaths and disappearances of their loved ones. We have unmarked graves. But we dare not mourn overtly for their deaths or search for their graves. That would be unpatriotic. Mullivaikal is the village that turned out to be the decisive battle field. It was at Mullivaikal that the 26-year-old civil war came to an end. In a shallow inland lake nearby, the victorious Sinhala patriots from the Ruhunu heartland built a monument to mark the triumph of Mullivaikal. It is a 30-feet tall bronze soldier that springs out of the ripple-less silent water. Four granite lions guard the base of the monument that is dedicated to the memory of ‘Ranaviru’ war heroes who gave lives to defeat the LTTE. The bronze soldier holds an assault rifle in his right hand while his left hand holds our National Flag with its sword-bearing lion deceptively distinct. The assault rifle in the right hand of the bronze soldier has a dove perched on it. That little bronze dove, while observing the silence of its metallic composition, seems to be quietly and resolutely cooing a message to the wider world. Perhaps it is that message of foreboding that prompted Keith Noyahr to think twice before appearing in person before the Magistrate’s Court in Mount Lavinia. There is nothing wrong with war memorials, not even in the case of a civil war fought against an enemy within that sought to undermine the State or to split it in half. Civilised nation states have built war memorials. The Russians built the ‘Motherland Calls’ statue to commemorate the Battle of Stalingrad. The Indians have a splendid war memorial – the Tawang War Memorial on the snow-capped peaks of Tawang in Arunachala Pradesh for the martyrs of the 1962 Sino-Indian War. War memorials are built for a purpose. They are built by civilised nations after traumatic conflicts that demanded great human sacrifices. What is the essential function of a war memorial? It helps the healing process. It must help the survivors of both sides of the conflict to make sense of the past and make peace with the past. A war memorial should invoke positive public discussion. Today, we are intimidated by the Rajapaksa monolith that took firm root after the military triumph. We dare not challenge the triumphalist notion of self-righteous aggrandisement of the State that crushed terrorism. In his percipient study of the use and abuse of political memory ‘In Praise of Forgetting: Historical Memory and its Ironies,’ David Rieff points out that when wars end with the overwhelming defeat of one side “victory confers the power unilaterally to shape the collective memory of the conflict”. What Mahinda Rajapaksa’s war memorial does is to demand from the Tamils that they swallow their grief and any bitterness to grasp an uncertain harmony. This writer is a Sinhalese and also a Buddhist. No doubt these remarks will prompt some patriots to suggest amendments to the column in my birth certificate where details of my father and my mother are spelt out. That indeed is a small price to pay in this attempt to make an honest map that depicts the correct contours of our collective political memory. Time and time again in history, a certain personality type assume power after cataclysmic conflicts. They are charismatic, charming, calculating and cruel. They are devoid of empathy and full of grandiosity, thirst for power and totally indifferent to conventional rules and norms of conduct. They are tyrants that people learn to follow willingly. Mahinda Rajapaksa is such a man – a malignant narcissist. It seems we have not seen the end of his tyranny. Watching the stupid, inept bungling of the successor regime that has only marginally resuscitated our democracy, we seem to have forgotten the blackmail, the outright threats, and the manipulations we were subjected to in the post-civil war five years, when Mahinda Rajapaksa exercised his leverage though his immediate and extended family. The video recording of the former President fielding journalists’ questions after his encounter with the CID investigators is now available on the internet. Quite nonchalantly, MR makes the counter argument. All right, what if he did make the call. The man was released. What is wrong with that? That is what is frightening about Mahinda Rajapaksa who may yet make a comeback. He does not find the abduction and assault of the journalist either shocking or reprehensible. Mahinda Rajapaksa presided over an efficient Government. It delivered results. The declared objectives of the powers that be were implemented by a State mechanism that ceased to think but acted reflectively. If a practice of intimidation became a daily routine, surely the nation that reconciled itself to such routine procedure cannot suddenly wake up and cry foul. Mahinda will be remembered in history. He rewrote history and the Constitution. We created Mahinda Rajapaksa. Reeling under the pressure of unimaginable terror we wanted decisive action. We wanted a leader who took swift action against a mad terrorist as against other leaders who were too soft. So, we went about creating our own evil to counter the evil that threatened us. So, defeating Prabhakaran’s armed terrorist evil we ended up with the coercive political evil of the Rajapaksa regime. Mahinda was not pretending when he claimed not remembering the call from Karu Jayasuriya. He was just doing what he does very well. He was constructing a new history to replace memory. Under the Mahinda presidency the State was sovereign. Not the people. That sovereign power determined who lived, who dies and who got abducted and maimed. The true lesson of Mahinda Rajapaksa’s presidency was the impotence of reason, contempt for the truth and the impudence of assuming that history was theirs to make or unmake. The historical animosity between Poland and Russia was insurmountable through centuries. The Poles had a bitter joke. Who does a Pole kill first? A German or a Russian? A German of course! Duty before pleasure. In the year 2010, the Russian Parliament finally acknowledged that Stalinist Russia and not Nazi Germany was guilty of the mass murder of 22,000 Polish officers in the Katyn forest in western Russia IN 1940. The Poles have forgotten the old joke.